Chrononauts is now more than ten years old, and it's showing its age. A lot has happened in the 21st century, but the TimeLine stops at 1999! 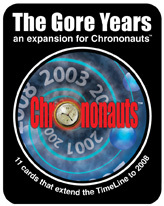 Introducing the Gore Years, an 11 card expansion for Chrononauts which extends the TimeLine from 2000 to 2008. 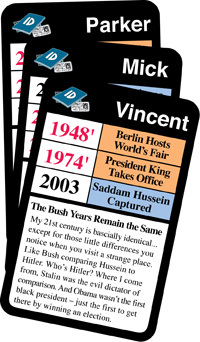 The set includes 5 new TimeLine cards, 3 new Patches, and 3 new Characters who depend on this new strip of TimeLine. Who was John McCain's running mate in the Alternate Reality election of 2004'?